Front door security is so important. You can read about how to secure a door with our IKS Locksmiths front door security tips. When you are talking about communal entrance doors security becomes more high risk. Communal entrance doors for flats have multiple key holders increasing the likelihood of a security breach. Securing door locks well form communal properties needs to be approached with a different mindset. What is the Best Way to Secure a Door When it is Shared? A strong door is a must. If choosing a new or replacement communal door quality is of the utmost importance. This article and this article on The Crime Prevention website give information on communal door security and are a good read if you are looking into replacing or choosing a new communal door. 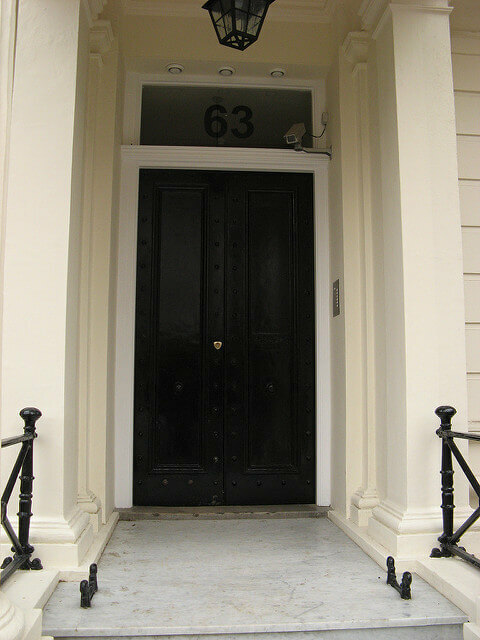 Door reinforcement is particularly important when it comes to communal door security. The use of a London bar and a Birmingham bar are recommended to strengthen a door and prevent against forced entry. It is important that residents form good habits remembering not to let others into the building unless they know they live there and never leaving the communal door propped open. A door closer is highly recommended to prevent doors being left open by accident. Communal door entry systems can have the advantage of being keyless. The disadvantage however is that many of these are powered by electricity and fail in the event of a power cut. If you are choosing an intercom system a lock that cannot be slipped open will make your door more secure than others. Cisa locks are one of the best locks for this purpose. For a communal door an autodeadlocking lock is a must as it can’t be slipped open with plastic. I would advise choosing one which meets BS8621. A basket on the inside of the letter box to collect post will prevent the door getting blocked. Regular checks and maintenance of all doors is important. Care and maintenance is especially important with communal doors due to the volume of people using the door. A communal door should never have a deadlock that can’t be opened without the use of a key on the inside. There must never be more that one action to unlock a communal door without the use of a key from the inside. At IKS Locksmiths we are North London based experts in residential security. You may also want to read our guide to the best locks. You can find lots more tips on Facebook where we have a wealth of information on all subjects relating to physical security. If you would like to know anything further about window or door security, security doors or anything to do with physical security we would be happy to offer our advice. We are North London based Master Locksmiths specialising in Locks, Security Grilles and Safes. Thanks for the reference to The Crime Prevention Website.com, which I operate as a hobby. A very interesting and informative website. Thank you!